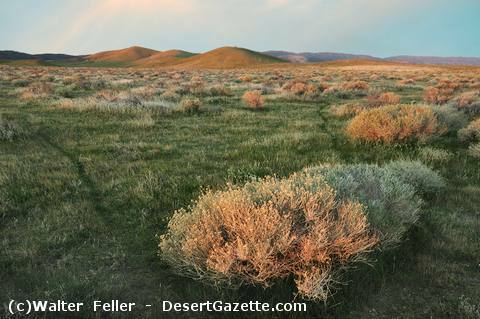 Well over 100 years ago antelope were plentiful in the broad, far western valley of the Mojave Desert. Man needed to get his minerals and metals to market from more remote corners of the land and so the railroad was built. The antelope were so numerous they became a hazard to the trains and expeditions of hunters were formed to rid the land of these creatures. With the annoying antelope finally extirpated and annihilated, the suppliers to the miners and railroad came and stripped the land of the Joshua trees and juniper forests to provide firewood and grow food on the denuded earth. Supply was meant to meet demand, and as the seasons grew hotter, minerals became less available, the farms were allowed to fallow and be taken over by small game and blankets of valley wildflowers. Wary jackrabbits and timid cottontails trace the valley floor with caution and have well-worn trails between here and there. The occasional coyote patrols between springs looking for a dinner. This is about to end as man has found another use for the land- Not tracts of homes and malls as one might expect, but to steal the sun to power air conditioners and televisions and countless other devices and gizmos and gadgets to occupy and entertain us in a place where there is little else to enjoy. Etc. The rats will live. The rats always survive.